The Cobra XRS 9445 provides total protection and peace of mind with the Xtreme Range Superheterodyne technology, detecting all 14 radar/laser bands with reliable and proven performance. It comes with the UltraBright Data Display, Voice Alert and much more. Spectre I Undetectable Provides complete immunity to Spectre I radar detector-detectors. 14-Band Detection Detects 7 radar, 6 laser and 1 safety signal. Radar signals include X Band, K Band, Ka Superwide, Ku Band, VG-2, Spectre I and Spectre IV+. Laser signals include LTI 20-20, Ultra Lyte, ProLaser, ProLaser III, Stalker LIDAR and Speedlaser. Safety signal is Safety Alert Traffic Warning System. Spectre Alert I/IV+ Alerts user when they are under surveillance of Spectre I/IV+ radar detector-detectors. IntelliMute Pro Relative speed sensing auto shutdown feature will render your detector undetectable by currently available radar detector-detectors. VG-2 Undetectable Provides complete immunity to VG-2 radar detector-detectors. 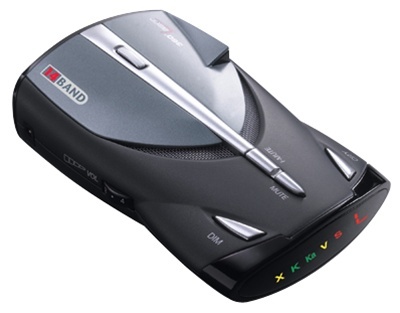 High Performance High performance radar/laser detector with reliable, proven performance. UltraBright Data Display Provides easy recognition of band detected by use of band identification icons. Ku Band Detection Detects Ku Band Radar Gun currently being used in Europe. Be prepared for future introduction in the U.S.
LaserEye Provides 360-degree detection of laser signals. Voice Alert Warns driver with specific voice annunciation of the signal being detected. VG-2 Alert Alerts the user when they are under surveillance of VG-2 radar detector-detectors. Safety Alert Warns drivers of the presence and/or approaching emergency vehicles, railroad crossing, and road hazard locations equipped with Cobra's exclusive Safety Alert transmitters. Auto Mute Automatically mutes the alert tone for enhanced driver convenience. IntelliMute Relative-speed-sensing Auto Mute system that virtually eliminates false alerts. Digital Signal Strength Meter Provides the driver with relative proximity to the target using 5-level digital signal strength meter. City/Highway Modes Allows the user to select operating mode, reducing the frequency of falsing in densely populated urban areas. Dim Mode Allows the user to dim the radar detector display enhancing night driving visibility. Stay Set Electronic Memory Electronically remembers radar detector settings for an indefinite period of time even with the power removed. All Cobra radar detectors come with the radar detector, a power cord and windshield mount and include a 1 year warranty.